Cookie dough scoops are great to have to make sure all your cookies are uniform in size. 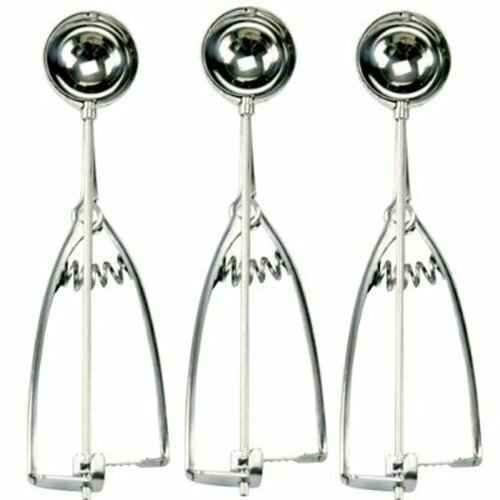 Cookie scoops come in three sizes: small, medium, and large. A small size cookie scoop is sometimes referred to as a teaspoon size scoop. It actually holds about 2 teaspoons dough. A medium size scoop can also be called a tablespoon scoop. It holds just over 1-1/2 Tablespoons dough. A large size scoop is made for making bigger cookies. It holds 3 Tablespoons dough. Sometimes you will be making jumbo size cookies. The recipe will specify using a 1/4 cup dough per cookie. In these cases, you can use an ice cream scoop instead of a measuring cup. I love my cookie scoops. They aren’t essential, but they are less messy and very convenient. The cookies come out great looking every time too.